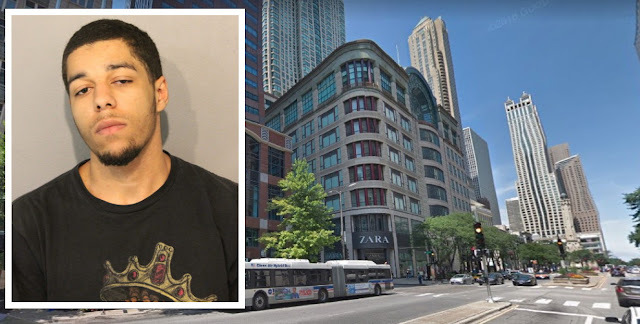 An Evanston man who’s charged with Class X felony armed violence and felony possession of a firearm after being arrested on the Magnificient Mile last Thursday was released from jail by posting a bail deposit of just $500, court records show. Police said 20-year-old Sheldon C. Graham was in the back seat of a car that officers stopped in the 600 block of North Michigan Avenue around 5:30 p.m. During a search of the vehicle, police allegedly found a loaded 9-millimeter handgun under the front passenger seat. The weapon was pointed toward the front of the car and officers were unable to pull the gun out from in front of the passenger seat because the seat’s support system blocked its path, they said. So, police concluded that the weapon belonged to the person who had easy access to it: the guy in the back seat, Sheldon Graham. Officers said the gun was "uncased, loaded, and immediately available" to Graham. Graham denied knowing that the gun was under the seat in front of him and said it wasn’t his. Police were unable to trace the gun’s history because its serial number had been etched off, according to court records. At the police station, officers conducted a custodial search of Graham and found him in possession of 20 Ecstasy pills, prosecutors said. Graham is charged with Class X felony armed violence; felony aggravated unlawful use of a weapon in a vehicle; felony possession of a firearm with a defaced serial number, and felony possession of Ecstacy or an analog. Class X felonies are the second-most serious level of criminal charges in Illinois, behind murder. Judge David Navarro set Graham’s bail at just $5,000, which allowed the suburbanite to go free by posting a deposit of only $500. Considering that Graham is literally charged with a Class X felony called “armed violence,” we’re a little puzzled as to what Preckwinkle considers violent crime.